I hate to be a pessimist, but it pains me to see the stupidity that goes hand in hand with the constant rosy optimism and green shoots mentality. Yes, as Americans we are inherently optimistic and I am all for that sentiment as it has made this country great and gotten us through tough times in the past. In days gone by we would work together as nation to overcome adversity, but today everything is fractured between political interests and corporate interests. Moreover, somehow the can do spirit of America has turned in to the fix it all powerful government, make the problem go away I want no pain society. Now I am not one who believes in pain when it can be avoided, however, there are times where we have to take our medicine. This refusal to allow the economic medicine to be administered goes back to the Bush administration and prior. I would argue that the seeds for all of today’s problems germinated under the Greenspan FED, of course Brenake being a disciple has taken the gospel forward and compounded our problems. In professional sports there is a saying that between each pitch or play that you need to clear the mechanism. For example a major league pitcher has to make each pitch separate from the prior pitch, especially if things did not go exactly as planned on the last pitch. If the pitcher does not do this then it usually leads to a worsening situation where errors are compounded. Most if not all the problems we are having today are because the economic mechanism was never allowed to reset. The problem now is that it is impossible to reset the mechanism without devastating the economy and many innocent individuals too. Things are too far gone for an easy fix, the window for the easy fix closed during the Bush administration since we did not “organically” grow the economy instead we put it on easy money steroids. Sure the economy boomed and looked good, but it was not healthy. It is no different than reports you hear about athletes that take steroids and look like an Adonis today only to become debilitated due to an enlarged heart or other complication of the steroids years later. In the case of the economy the steroids are a cocktail of excessive cheap money and debt both public and private. Each day that goes by and more of the economic steroids are applied we get stranger outcomes. The problem is that the situation has gotten so far out of control that if the merry go round was stopped it would be very painful. This is not to say that we will not have to face a reckoning day, we will and it will be painful particularly for those with high debt levels or who are invested exclusively in paper assets only. The government can’t and shouldn’t have tried to fix this mess early on with the drug of cheap money; if they stood aside then we would be in a completely different and better situation now. So what is the fix of the day? Is it he FED or the G20… Does it matter? 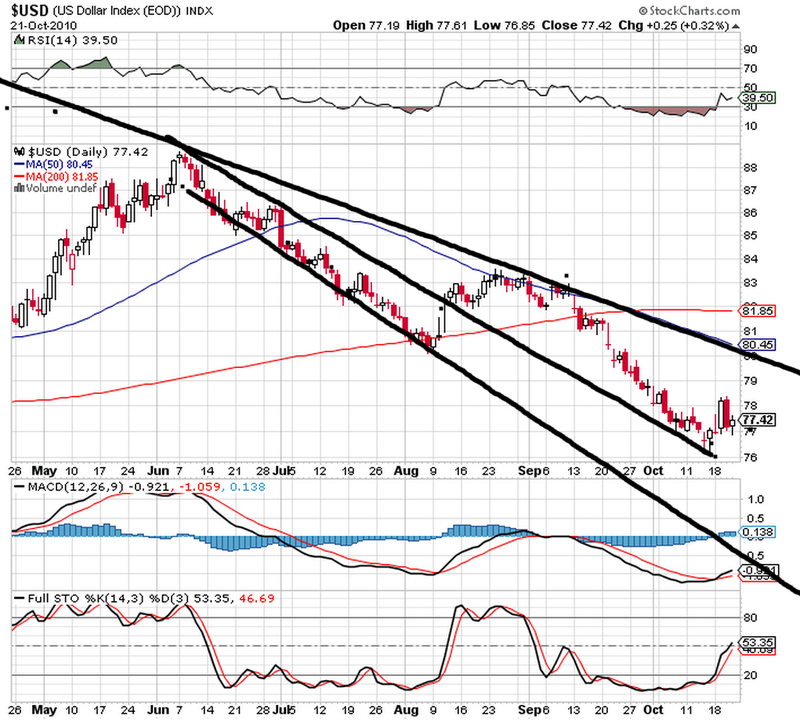 As I write this the Dollar is treading water, Gold is down and the Dow is down too. So what is going on? There are a combination of factors that have gripped the market and caused the role reversal of the market and gold versus the Dollar. Ever since the August meeting in Jackson Hole when Mr. Bernake came out and stated that the FED wanted to set a higher inflation target and mentioned QE2, the markets took off like the space shuttle. Adding fuel to the fire others at all levels of the FED came out in support of Bernake’s statements and dear reader as you know from that point on the markets were rockin’ and rollin’. All markets were up and every inflation gauge outside of the FEDs gerrymandered CPI were heading straight for the moon. 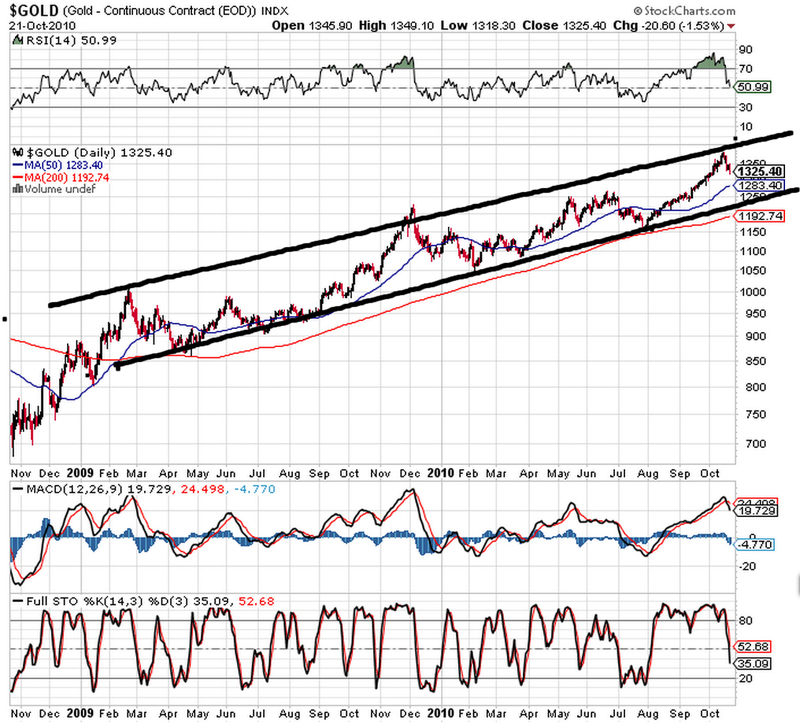 At the same time the Dollar which the FED is trying to manage down in an orderly fashion appeared to be at the precipice of a severe decline even though it was technically oversold while gold was technically overbought. Now personally I believe in bull markets and bear markets with normal market forces in play and individuals are left to their own devices overbought\oversold indicators are less useful because the supply of buyers or sellers keeps expanding as new entrants find their way in particularly in smaller markets like gold and silver. If one has any doubt about this then go back and take a look at some charts from the 1998 to 2000 period and you can find many stocks that stayed overbought for months and continued to go up. So over the last couple weeks it looked as if happy days were here again and things were getting to far ahead of themselves for Bernanke and Turbo Timmy’s taste. The result is you had the minority hawkish fed governors like Bullard and then Hoenig yesterday making temperate statements regarding the QE2 prospects, which threw cold water on the markets and gave the Dollar a footing. The next issue coming to the fore is the G20 meeting in Seoul Korea. Documents were “leaked” showing that Turbo ”Timmy” has a grand trade balancing plan that would use budgetary process to curb trade deficits and boost exports. He is also calling for G20 members to refrain from using competitive devaluations of currency and suggested a target of no more than 4% surplus or deficit as a percentage of GDP. All I can say is WOW! I guess all the money Turbo “Timmy” saved by evading taxes must have gone in to some good drugs. One has to ask what is the color of the sky in “Timmy’s” world? First off there are already reports of noncooperation leaking out of the G20 meeting and what would one expect based upon the history of the G20. I mean seriously when it was only the G7 there were occasional agreements, but now with 20 diverse nations each with a self interest you are expecting agreements especially anything that would help the US, please! Timmy is proposing the put a 4% cap on trade deficits and surpluses he is out of his mind. Under the structure of the economic world in its present from there is no way we can get the trade deficit\surplus figures to jive. We don’t live in zero sum world although the current administration would like to implement this; it still works out that for every winner there is a loser. Even Japan's Finance Minister Yoshihiko Noda on Friday called the idea of targets "unrealistic.". Of course it is unrealistic to Japan with their own economic problems if they had to cut their exports to meet the 4% trade surplus number it would probably collapse their economy as they are so dependent on exports since their stock market bust of 21 years ago. More breaking news that Timmy's grand plan is not viable comes to us from a CNBC report. "We didn't expect much to happen. We didn't think that the fundamentals brought them to a place where they could have some agreement," said Robert Sinche, global head of foreign exchange strategy at RBS. "Obviously (Treasury Secretary Tim) Geithner's poposal on some quantitative targets is being shot down. I just don't think they have any common ground on which to agree on things." I am sure you are shocked dear reader, as shocked as when you watch your favorite movie again but this time expecting a different outcome. It is not written anywhere, but obviously “Timmy” believes that all the countries will put aside their own self interests to help the US out of its pickle. If we actually had free markets then everything would balance itself out over the long term, but imposing a management scheme like this will only lead to distortions and new problems. Again the EU is a living example of managing economies or deficits by decree sounds great in theory but fails in practice; just look at Greece, France, etc…. We cannot have a closer balance of trade with China for example because while we still manufacture products in the US we don’t manufacture nearly enough nor at a price that is competitive for world buyers at least not without an even lower Dollar. I don’t mean to pick on China alone because the same problem extends to most countries. Ironically a lower dollar would solve this problem in the long run but it would not be an easy painless fix. How did the US get in to this position? We can look at some of the statistics that highlight why we the trade deficits cannot be gotten under control. For example since 2001 about 42,000 US factories have either moved overseas or shuttered all together. These are jobs that may never come back and cause a shrinkage in the amount of product we can export to offset trade deficits. Since 2000 we have lost upwards of 5.5 million manufacturing jobs along with those factory closings. Many of the same companies that closed factories here are increasing employment at foreign factories which adds to their bottom line but continues to hollow out the middle class and increase the trade deficit. We as a nation are not energy independent and have to import over 60% of our petroleum needs which fuels the trade deficits even further. The bottom line is that while the bubble economy was in play and people were employed the trade deficit did not matter nearly as much. In fact one could argue the trade deficit was a good thing as it drove down the prices of consumer goods but it did it at the expense of killing our wealth making businesses that employed many. Now that many of the wonderful high paying jobs of the bubble period are gone we have no base to fall back on which why Timmy’s plan is not viable or well received. Our leaders need to get serious and learn “wealth is manufactured not printed”; and by manufactured I mean production of goods not economic or statistical trickery. 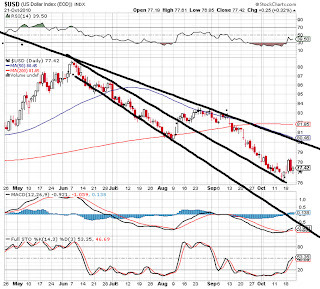 As for Gold and the Dollar I have attached two charts that you can view. The charts are End Of Day prices for both gold and the Dollar index. While the current correction is difficult to stomach I thought a picture is worth a thousand words. You can clearly see the channels showing the direction and trading ranges of both. I also included the stochastic indicator which gives you a sense of oversold and overbought conditions which shows gold further in to oversold than the dollar into overbought; but both well off the extremes. 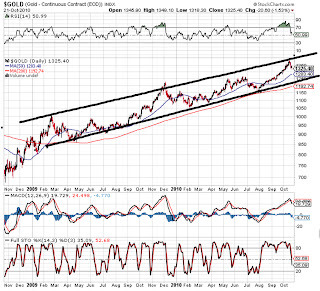 Unless the Dollar violates the top trend line with sufficient vigor and gold violates the bottom trend line in the same fashion then this is just a correction in both. Please excuse the lines as I drew them free hand on a tablet.